The Ukrainian National Republic declared in 1918 claimed more territory than it ever controlled. As soon as German military protection was removed, the territory it did control contracted rapidly. 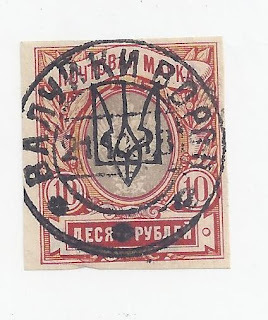 Very occasionally, you see General Issue or trident overprinted stamps used in 1918 outside "core" Ukrainian guberniyas, most often Minsk and occasionally Kursk. The stamp shown above is the first I have noticed with a Voronezh guberniya cancel. The small town of Valuyki is now in Russia, 15 km outside the modern Ukraine - Russia border, so it's possible that it was briefly under UNR control in 1918. The cancellation is dated 21 10 1918, so shortly before the German collapse. It could be CTO but I rather doubt it - the cancel is characteristic of use on a Money Transfer or Parcel Card. The stamp itself with Kharkiv III overprint is scarce but not rare (Bulat # 758, $65). The cancellation, of course, makes it much more interesting. The stamp is signed both UPV and Philip Schmidt in whose collection I found it. I will send it to Filateliapalvelu in Finland for auction. Added 12 August 2016: Roman Procyk has kindly contributed the following scans showing Kharkiv trident use on Telegraphic Money Orders at at Valuyki. 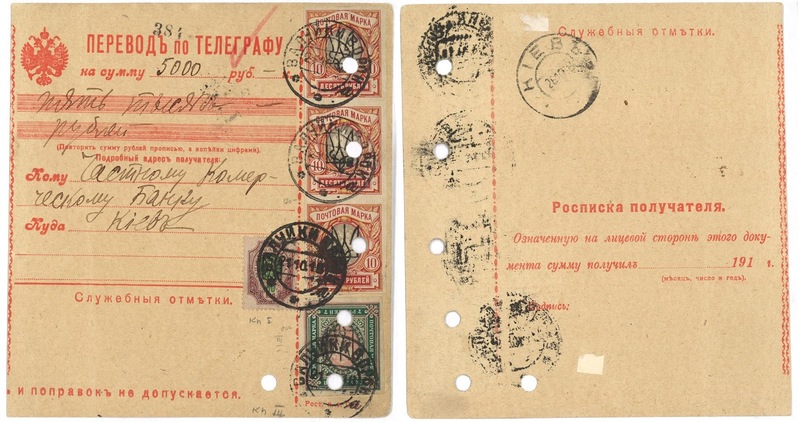 They provide additional evidence of the little-known use of Trident stamps in Voronezh guberniya. 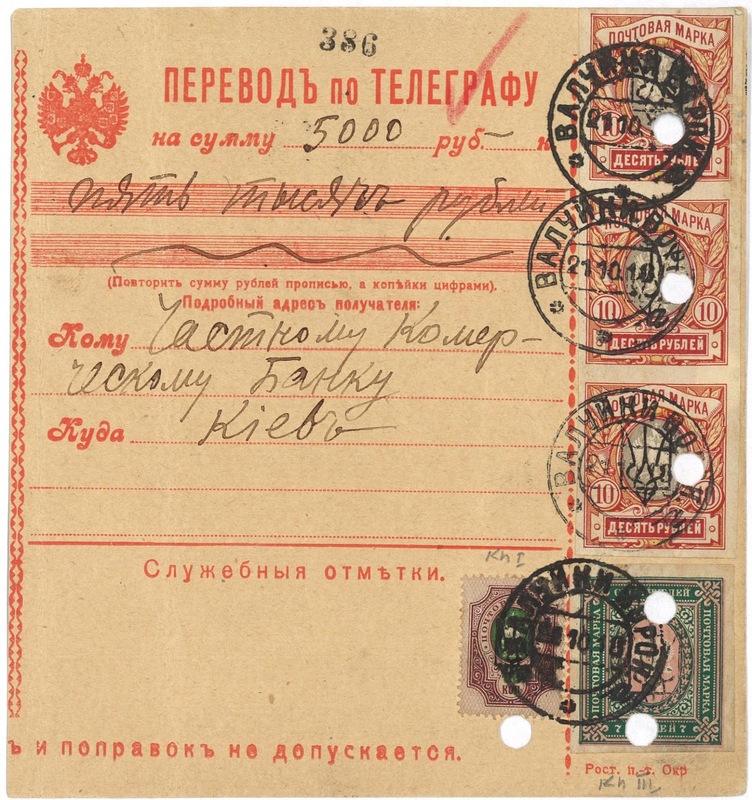 Note the dates, late in the period of German Occupation of Ukraine, and the destination - a bank in Kyiv (written in Russian). Labels: Ukraine Tridents, Ukraine tridents of Kharkiv, use of Ukraine tridents in Voronezh.